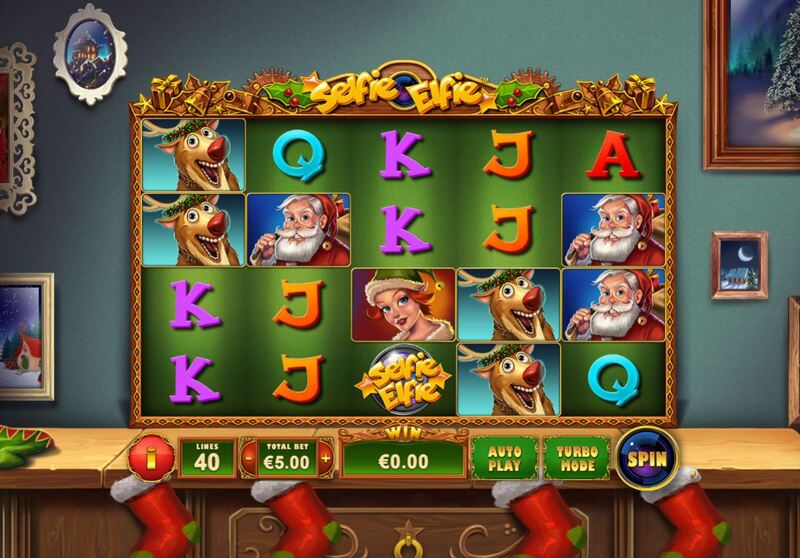 Selfie Elfie slot is an attempt by Playtech at some seasonal jollity. It's Christmas theme has a cartoon style which somehow combines selfies with Santa's elves. Our game here is set over a lounge room all decked out for the season of goodwill and we spin to some gentle Christmas music and a bit of the old Jingle Bells when features occur. How does Selfie Elfie compare to other classic slots of the same theme, for example Microgaming's Deck The Halls or Holly Jolly Penguins with their exciting features and big hit potential? Well I get the immediate feeling that we have a far less volatile game here so will we be pulling a cracker or unwrapping yet more old socks in this house? Selfie Elfie gives us 40 paying lines over 5 reels of 4 rows and stacked symbols in our stocking. Wilds only appear singly for now and are the most valuable present of all at 12.5x your stake for a 5-of-a-kind. Santa awards 10x, Granny 7.5x, Rudolf 5x, Pixie or Elf 2.5x and Gingerbread Man 2x. The rest are four card values paying from 1x down to a mere 0.3x for a full line. I wouldn't worry too much about this as Selfie Elfie has a little trick up his sleeve to assist us in getting some improvement on this! Randomly you may see a wheel scroll across the top of the grid which features all the high-paying symbols. This will stop on one of them and then all occurrences of that character turn wild on the grid, if any. If you do create any extra Wilds, then another spin of the wheel is given which may or may not create more Wilds and so-on. Now beware! as some Selfie symbols on the wheel are in black-and-white so won't activate any Wilds and the respins stop or don't even get started, plus any position on the wheel which does create the Wilds will turn black-and-white afterwards, thus reducing chances as the respins go on. Quite simply, these are triggered by the game logo scatter appearing on reels 1, 3 and 5. You get 8 spins which cannot retrigger and unsurprisingly the respins wheel above the grid is active in all of them. It does now have a +3 added for the chance of extra spins but the frequency of the duff monochrome selfies seems to be higher too. You won't have much of a Merry Christmas here I'm afraid.